That time of year is just around the corner. You have everything set to go, the food and the beverages are waiting patiently in the cooler, the guests are enjoying small talk, everything is just waiting for the barbecue to be wheeled out and set up. And cleaned. And checked for fuel. And when the igniter fails, double checked three or four times. The guests’ idle chit-chat patters on and eventually peters out, and everyone is waiting for something to go right. This, while an uncommon and admittedly theatrical fiasco, is still a possibility. Instead, we offer a service that makes a barbecue less of a centerpiece and high-pressure event, and through the use of an outdoor kitchen as a natural –and tasteful- extension of your home, invite you to enjoy the experience instead of fretting over the details. At M&S Architectural Ltd., we have been offering the King City, Caledon, Newmarket and Aurora areas a way to seamlessly blend a singular, but important facet of your house, the kitchen, into a patio experience unlike any other. 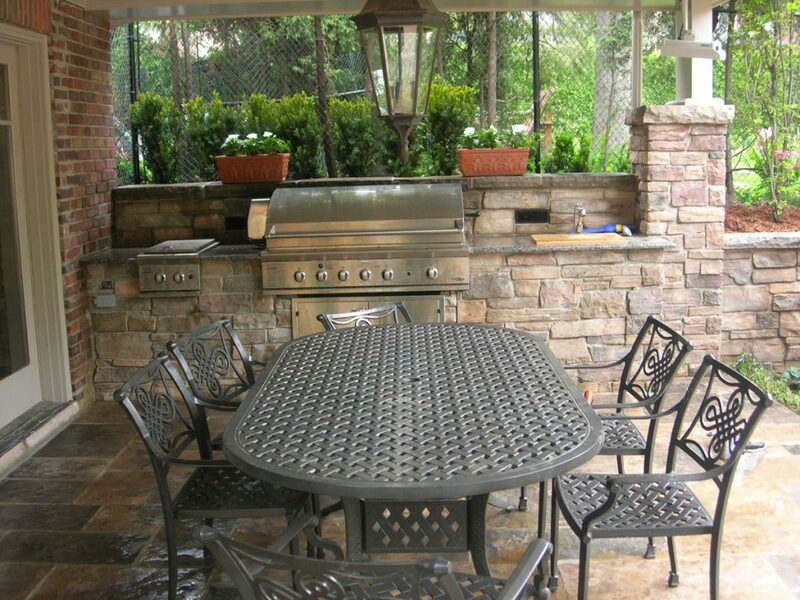 With several years of experience, specializing in stone, woodworking, roofing and lighting to augment an event as small as family dinner or as large as a graduation party, we have made outdoor kitchens a staple part of many lives. What sets us apart is not our extremely talented and skilled technicians and craftspeople, but instead our service. M&S Architectural consults with you, the owner, as the planner and homeowner at every step along the way, starting with your initial idea for an outdoor kitchen and doing everything we can to make your dream into a physical reality. Your input is not only valued, but required. It is, after all, your house. M&S Architectural is simply trying to facilitate you in achieving your dream home. What Sets Our Outdoor Kitchens Apart? Another factor that sets us apart from the competition is our awareness of the conditions we are working in. Have you ever had a barbecue in January? A more important question is why haven’t you? Even though winter in Canada is no joke, given the proper amount of planning, we can help you create a warm, roofed outdoor kitchen for that outdoor barbecue flavor no matter the weather, improving the experience through our expertise in roofing, and yes, for those of you who like the “evergreen” feel, even artificial turf. Our consultants will guide you every step of the way in creating your ideal recreational space. Who stands to benefit from our services? Anyone living in King City, Caledon, Newmarket, or Aurora who wants to raise their property value and get more use out of their backyard. We are willing to work with you to make your ideal house a real home.